The Crowded Street is on my Classics Club list, so when I saw that Jessie of Dwell in Possibility was hosting a Persephone Readathon this week, my choice was obvious. This particular book has also been published as a Virago Modern Classic, but my edition is the Persephone one, with the endpapers pictured below. Having already enjoyed several of Holtby’s books – South Riding, The Land of Green Ginger and Poor Caroline – I’ve been looking forward to this one for a while and I’m pleased to say that I loved it even more than I hoped I would. The novel was published in 1924, at a time when it was assumed that most young women wanted nothing more than to find a husband and then stay at home to raise their children. 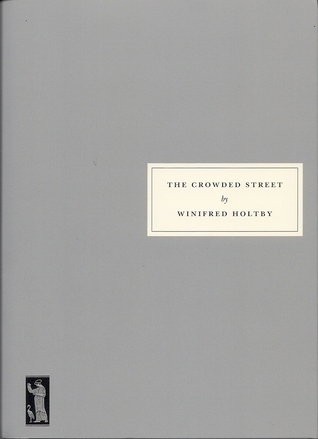 In The Crowded Street, Holtby looks at what it was like to be a woman who, for one reason or other, was unable to conform to these expectations. Through the stories of Muriel Hammond, her sister Connie and her friends Clare and Delia, she explores the very different routes through life taken by four very different women. As a single woman myself, there were times when Muriel’s story resonated with me, but thankfully not all the time! I may not be married, but nobody ever prevented me from going to university or getting a job. Muriel watches with envy as Delia, another unmarried girl from the same Yorkshire village, goes off to Cambridge University, then heads for London and throws herself into political activism. Of course, some women today are happy to stay at home with their parents, there are some who find plenty of fulfilment in marrying and having children, while others want to move away to pursue their career. There is no right or wrong way to live, but the point is that we have a choice. What makes Muriel’s story so tragic is that she feels she has no choice. She believes that marriage is the only possible way to escape, but if that doesn’t happen, all she can do is continue to help her mother around the house, doing what she sees as her duty (even though her help isn’t particularly necessary). As a result, she becomes more and more depressed, feeling that life is passing her by but lacking the confidence to do anything about it and making excuses to justify why she can’t. Her younger sister, Connie, tries to break away from the stifling confines of life in Marshington, but she is so desperate that she makes a bad decision which has disastrous consequences. It seems that the only one who is likely to be happy is Muriel’s old school friend, the cheerful and sophisticated Clare, who goes through life without a care in the world and catches the eye of Godfrey Neale, the one man Muriel dreams of as her own potential husband. Clare, though, has the opposite problem. Having had a very different upbringing from Muriel and Connie, will she be able to adapt to living in a small Yorkshire village? Well, Winifred Holtby has written that book and I don’t think it’s quite true that nothing happens to Muriel. She does develop as a person as the novel progresses and, although it takes a long time, she slowly becomes aware that if she is to have any happiness she will have to take matters into her own hands. I loved the way her story ended: she has an important decision to make and in my opinion she does the right thing. As well as following the characters I’ve mentioned above, we are also given some insights into the effects of the First World War on small communities like the fictional Marshington. I particularly enjoyed the vivid depiction of the bombardment of Scarborough in 1914, something Winifred Holtby could draw on personal experience to describe. The Crowded Street is a wonderful book in so many ways and a great choice for both the Classics Club and the Persephone Readathon! I liked this one too though it’s been several years since I read it. I loved South Riding and I still own Poor Caroline and Mandoa, Mandoa! I find it so infuriating that single women were expected to stay home and take care of their parents, I see it over and over in novels. I do love reading books written and set in the past but that is one of many reasons I would never want to travel back in time! Yes, it is infuriating, especially as they were made to feel that they didn’t have any other choice. I wouldn’t want to actually go back in time either – I prefer just to read about it! If I can remember, in Vera Brittain’s “Testament of Youth” she is summoned back from front line nursing during the First World War to look after her mother, who is not actually ill. This made her understandably furious, and as Holtby was her great friend this may have influenced this and other novels? I had forgotten that – it’s been such a long time since I read Testament of Youth. I’m sure Vera Brittain will have been an influence on some aspects of this novel. I suspect she could have been the inspiration for the character of Delia. I loved this, though it is a while since I read it. I have the vmc edition though. I may get the Persephone edition to match one day. It’s a great book, isn’t it? I can see why both Virago and Persephone wanted to publish it. I liked this one, too, although it’s been a while since I read it. I’m glad you liked it too. I love Winifred Holtby’s books. This sounds a wonderful book. I have always had difficulty with South Riding. I’ve never understood why that is – it’s the sort of book that I ought to like. Perhaps this novel from Winifred Holtby might ease me into her writings. I have read four of Holtby’s novels now and I’ve found them all quite different from each other. Even if South Riding wasn’t a success with you, I think there’s still a chance that you might enjoy this one. Great review, Helen! Well put! Hope you’ll pardon this comment from a male, but it’s dispiriting enough to read where men advise young women to ‘know their place’ in the home, to be a devoted and selfless wife, mother and homemaker; but reading of other women perpetuating the myth that females should not have ambitions beyond their traditional role is deeply depressing. More so when one knows that fiction followed real life in that respect, and that this calumny is still persistent today in so many cultures. I’m sure this novel goes way beyond the limitations of those antedeluvian expectations but just the thought of it makes me angry. Yes, it’s very depressing to think of the pressure young women were under to conform to a traditional role in the home and to give up their ambitions, particularly, as you say, when that pressure came not only from men but from other women as well. As Winifred Holtby was a feminist and political activist, she would not have been seen as a conventional 1920s woman and I’m sure this book would have been partly autobiographical, highlighting the difficulties of breaking away from the expectations of the time. This is a wonderful review! Though the story is tragic in many ways, that Holtby can articulate Muriel’s situation, is a treasure. Thank you, Laurie. Winifred Holtby never married, so I suspect she was drawing partly on personal experience to write about Muriel’s situation. I thought it was a fascinating and very moving book. I love this book and have read it a few times. I also own a Virago copy. South Riding is one of my favourite books of all time but I think I have a few of hers left to read. I didn’t manage to take part in the readathon because i was away, but I’ve enjoyed seeing people’s posts about it. I think I’ll probably want to read this one again too – it’s the sort of book that leaves you with a lot to think about. I loved South Riding as well. I really enjoyed this review, Helen! I adored South Riding when I read it a few years ago and have wanted to read more of Holtby’s work ever since. I have an ebook copy of The Crowded Street and think I will have to pick it up soon. Thank you, Jessie! I loved South Riding too and have been slowly working through Winifred Holtby’s other books. This is one of her best, I think. I thought I had read this one as well, but just a few sentences into your review realised I have not (I must have been thinking of Poor Caroline, but I’ve also read South Riding, and loved it as much as others here have, and Anderby Wold, which I also really enjoyed). Now I’m off to scrounge up my Holtby volumes and hope this one is amongst them! I hope you’re able to read this one…it’s a wonderful book. I still haven’t read Anderby Wold, so I’m pleased to hear you enjoyed it!